A flurry of earthquakes as powerful as magnitude 6.3 struck in the Pacific Ocean off Guam Saturday, hours after a large temblor hit the region. The aftershocks were centered 230 miles south of Guam, the same area as the powerful 7.2-magnitude quake that hit earlier in the day, according to the U.S. Geological Survey. In addition to the 6.3 temblor, aftershocks hit with magnitudes of 4.6, 4.7, 5.0, and 5.2. None posed a tsunami threat, officials said. Authorities on Guam and the nearby Commonwealth of the Northern Mariana Islands said that despite the large quake's size it wasn't felt and caused no damage. The USGS said the aftershocks apparently also went unnoticed. 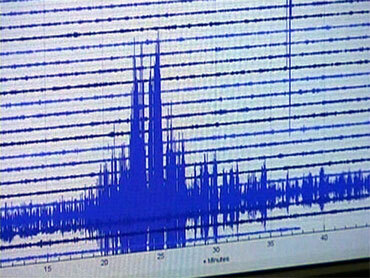 USGS geophysicist Randy Baldwin said such aftershocks are normal following a large quake. "That's especially true if it's shallow," he said. All the quakes were about three to six miles beneath the ocean floor. Guam is located 3,700 miles southwest of Hawaii.